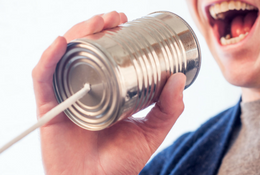 How to Generate More Word-Of-Mouth Buzz for Your Practice : LifeLearn Inc.
“I found out that everybody talks, everybody talks, everybody talks…” So say the the lyrics of the Neon Trees song, appropriately titled “Everybody Talks.” And nothing could be more true. Everyone talks, including your clients, and when they talk about your practice, it can be a really valuable marketing tool. Word-of-mouth recommendations are worth their weight in gold. For all the great things you can say about yourself, it’s always going to mean more coming from someone else. That’s why we push online reviews so much in this blog. But while 72% of people say positive online reviews make them trust a business more, a whopping 92% of customers trust word-of-mouth recommendations from people they know, the key phrase being “people they know.” Online reviews are pretty awesome, but there’s always a chance that they’re fake, or that the people making the recommendations are close friends and family of the service provider. The beauty of a word-of-mouth recommendation is that it leverages already established trust from close relationships – making it that much more powerful and effective. Unfortunately, you don’t have as much control over word-of-mouth recommendations as you do with other forms of marketing. You can’t force your clients to say nice things about you. So what can you do to encourage your clients to recommend you when the time is right? Sarah is clearly unhappy with her hairdresser and looking for a change, and because Jen’s hairdresser provided an amazing experience, Sarah will likely try Jen’s hairdresser. But there’s a third party in the conversation, Amy, who hasn’t said anything. Amy didn’t have a horrible experience with her hairdresser like Sarah did. Her hairdresser always does a fine job of her hair. But Amy also doesn’t feel particularly loyal to her current hairdresser, and Jen’s description of her hairdresser just sounds so amazing that Amy thinks she might try out Jen’s hairdresser for her next appointment. This scenario is what makes it so important to strive not only for “OK,” but excellence in customer service. Subpar service can make your clients feel apathetic about your practice, and when they feel that way, sometimes all it takes is a particularly glowing recommendation to lure them away. Feel like you’re already doing everything you can when it comes to customer service? Why not conduct a satisfaction survey to see if there are problem areas that you might be unintentionally overlooking? There’s always room to improve, and sometimes, clients can see those issues more clearly than you can. This could technically tie into the previous point, but we want to emphasize how important this is, and how it’s about more than just providing friendly service with a smile. Going above and beyond means doing the unexpected, such as providing free kits with appointments and coffee and tea in the waiting area, forward booking, going out of your way to accommodate and care for grieving pet parents, and just generally going past what’s expected of you. It’s very easy and tempting to fall into the mindset of, they’re not paying us to do this much, so why should we? But word-of-mouth recommendations are born from the unexpected, including the things they know you didn’t have to do, but did anyways. And if you foster a culture in your clinic of taking things to the next level, going the extra mile will become second nature. Give people an online reason to talk about you. What do people love talking about more than anything? Themselves! And when they’re particularly happy or proud of something, they’re highly likely to share it. A good way to tap into this is to share pictures of your patients online (with permission, of course). When you tell clients that you’re featuring their pet on your Facebook Page, you’re encouraging them to share that post with their friends and family. Not every client will share, but some will, and many of your clients have hundreds of Facebook friends. So even a few shares will get you in front of hundreds of eyes. Don’t miss this valuable opportunity to spread your clinic’s name. As an added bonus, your patients make great subject matter for your practice’s Facebook Page. It’s a win-win for your clients and your clinic. This tip isn’t for everyone. We understand that some clinics don’t like to give out discounts for a variety of understandable reasons. But for some clinics, a good deal can be a fantastic way to generate buzz, whether that’s a free first-time check up for adopted pets or 20% off dental cleanings during February. When clients get a good deal, they’re highly likely to tell others. And while a discount may just bring clients in for one visit, if that single visit includes the amazing customer service we mentioned earlier, clients might find they want to come back for even more. Participate in the local community. Participation in local events can be a great way to get people talking and thinking about your practice. Does your practice team turn out to local fundraisers or even host your own? Setting up a neuter/spay clinic or similar event can take time and effort, but if you do it right, you’ll not only help prevent overpopulation, you’ll also generate buzz for your practice at the same time. Occasionally, doing something that might that cost your clinic a little right now (e.g., a fundraiser for a pet charity) could pay out big time in the long run. Don’t forget to alert local media about your event. A well-timed email or phone call could have a local radio station setting up a booth at your event or some coverage on the local news – and that would be well worth the effort!Ultimately, word-of-mouth recommendations are only partially within your control. As nice as it would be, you can’t force clients to gush about your clinic. But you can give them reasons to talk, including amazing customer service experiences and memorable events that help your practice stand out as a great choice for their pet. After that, the rest is up to them.